Residents from neighbourhoods across the city are joining with community organizations to make their voices heard in this municipal election. When people living on low-income in both urban and rural areas don't vote, politicians are less likely to listen to them. 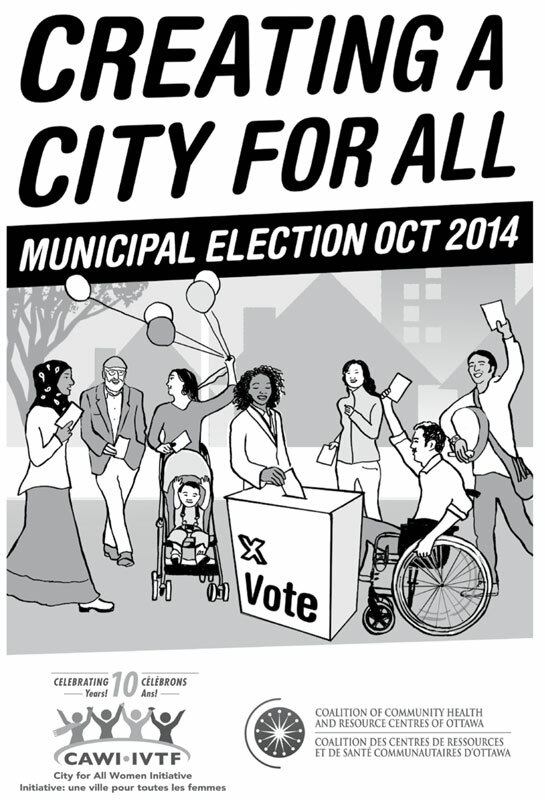 Join with hundreds of residents in this election to call on candidates to Create a City for All. To get involved visit: www.makingvotescount.ca. Not sure when or where to vote, visit: http://www.ottawa.ca. In the first year (September 2013-March 2014), a community participatory action research was held to identify barriers to voting in low-income neighbourhoods and strategies to address the barriers. A report on the research findings was released on March 5th, 2014. Twenty-five women who are from different neighbourhoods across the city and supported by the community developers participated in civic participation training, facilitated focus groups, and brought their issues to the attention of municipal decision makers. In the report, there are four strategies to create a culture of civic engagement identified: make it easy to vote, make it fun to vote; ignite the passion to make a difference; build bridges between candidates and residents. In the second and third years (April 2014-June 2016), more women are joining this project to help implement the civic engagement strategies identified in the first year research. With support of their community developers, they are facilitating Making Votes Count Cafes to educate their neighbours on the importance of participating in the long-term political process.